Media captionThe animals may be useful for studying cancers and immune disorders. Two monkeys have been cloned using the technique that produced Dolly the sheep. Identical long-tailed macaques Zhong Zhong and Hua Hua were born several weeks ago at a laboratory in China. Scientists say populations of monkeys that are genetically identical will be useful for research into human diseases. But critics say the work raises ethical concerns by bringing the world closer to human cloning. 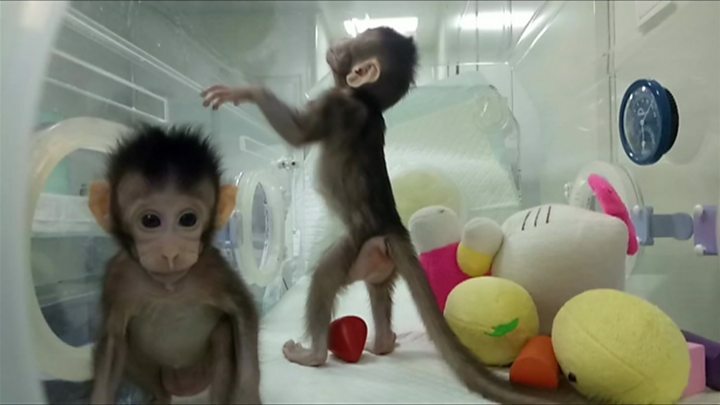 Qiang Sun of the Chinese Academy of Sciences Institute of Neuroscience said the cloned monkeys will be useful as a model for studying diseases with a genetic basis, including some cancers, metabolic and immune disorders. "There are a lot of questions about primate biology that can be studied by having this additional model," he said. Zhong Zhong was born eight weeks ago and Hua Hua six weeks ago. They are named after the Mandarin term for the Chinese nation and people. The researchers say the monkeys are being bottle fed and are currently growing normally. They expect more macaque clones to be born over the coming months. Prof Robin Lovell-Badge of The Francis Crick Institute, London, said the technique used to clone Zhong Zhong and Hua Hua remains "a very inefficient and hazardous procedure". "The work in this paper is not a stepping-stone to establishing methods for obtaining live born human clones," he said. Prof Darren Griffin of the University of Kent said the approach may be useful in understanding human diseases, but raised ethical concerns. "Careful consideration now needs to be given to the ethical framework under which such experiments can, and should, operate," he said. Dolly made history 20 years ago after being cloned at the Roslin Institute in Edinburgh. It was the first time scientists had been able to clone a mammal from an adult cell, taken from the udder. Since then many other mammals have been cloned using the same somatic cell nuclear transfer technique (SCNT), including cattle, pigs, dogs, cats, mice and rats. This involves transferring DNA from the nucleus of a cell to a donated egg cell, which has had its own DNA removed. This is then prompted to develop into an embryo and implanted in a surrogate animal. Zhong Zhong and Hua Hua are the first non-human primates cloned through this technique. In 1999, a rhesus monkey embryo was split in two in order to create two identical twins. One of the baby monkeys born through that technique - called Tetra - has the title of the world's first cloned monkey, but it did not involve the complex process of DNA transfer. In the study, published in the journal Cell, scientists used DNA from foetal cells. After the DNA was transferred to donated eggs, genetic reprogramming was used to alter genes that would otherwise have stopped the embryo developing. Zhong Zhong and Hua Hua were the result of 79 attempts. Two other monkeys were initially cloned from a different type of cell, but failed to survive. Dr Sun said: "We tried several different methods, but only one worked. There was much failure before we found a way to successfully clone a monkey." The scientists say they followed strict international guidelines for animal research, set by the US National Institutes of Health. Co-researcher Dr Muming Poo, also of the Chinese Academy of Sciences in Shanghai, said: "We are very aware that future research using non-human primates anywhere in the world depends on scientists following very strict ethical standards."